The PDB archive is available at no cost to users. The PDB archive is updated weekly. The PDB was established in 1971 at Brookhaven National Laboratory under the leadership of Walter Hamilton and originally contained 7 structures. After Hamilton's untimely death, Tom Koetzle began to lead the PDB in 1973, and then Joel Sussman in 1994. Led by Helen M. Berman, the Research Collaboratory for Structural Bioinformatics (RCSB) became responsible for the management of the PDB in 1998. In 2003, the wwPDB was formed to maintain a single PDB archive of macromolecular structural data that is freely and publicly available to the global community. It consists of organizations that act as deposition, data processing and distribution centers for PDB data. Stephen K. Burley became Director in 2014. In addition, the RCSB PDB supports a website where visitors can perform simple and complex queries on the data, analyze, and visualize the results. Details about the history, function, progress, and future goals of the RCSB PDB can be found in our Annual Reports and Newsletters. RCSB PDB development follows our Mission, Vision, and Values (PDF). Staff are located at Rutgers, The State University of New Jersey and the University of California, San Diego. Job listings for open positions are posted online. The Rutgers group has been featured on RU-tv and Biophysical Society TV. 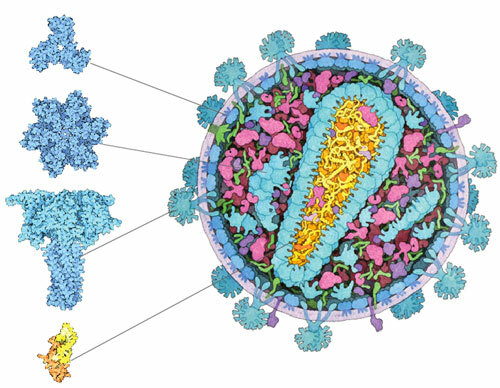 The RCSB PDB has an international community of users, including biologists (in fields such as structural biology, biochemistry, genetics, pharmacology); other scientists (in fields such as bioinformatics, software developers for data analysis and visualization); students and educators (all levels); media writers, illustrators, textbook authors; and the general public. The website (rcsb.org) is accessed by >1 million unique visitors per year. RCSB PDB services have broad impact across research and education. The primary RCSB PDB citation (Berman et al., Nucleic Acids Research 2000) is one of the top-cited scientific publications of all time. A bibliometric analysis performed by Clarivate Analytics (PDF) in 2017 shows PDB motivated high-quality research throughout the world. Papers citing had a citation-based impact exceeding the world-average in 16 scientific fields including Biology & Biochemistry, Computer Science, Plant & Animal Sciences, Physics, Environment/Ecology, Mathematics and Geosciences. An economic analysis performed by the Rutgers Office of Research Analytics in 2016 noted that a reasonable estimate to replicate the PDB data archive is $12 billion (PDF). The use value of RCSB PDB data and services is estimated at $5.5 billion annually. The RCSB PDB Advisory Committee is made up of an international team of experts in X-ray crystallography, cryoEM, NMR, bioinformatics and education. RCSB PDB appreciates the valuable feedback they provide on an ongoing basis. 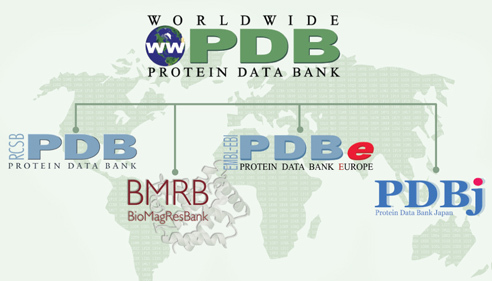 The RCSB PDB is a member of the wwPDB, a collaborative effort with PDBe (UK), PDBj (Japan), and BMRB (USA) to ensure the PDB archive is global and uniform. As the wwPDB archive keeper, the RCSB PDB updates the PDB archive at ftp://ftp.wwpdb.org weekly. The structures included in each release are highlighted on the RCSB PDB home page and clearly defined on the FTP site. These sites are maintained 24 hours a day, seven days a week. A failover system automatically redirects internet traffic to a mirror site, if needed. 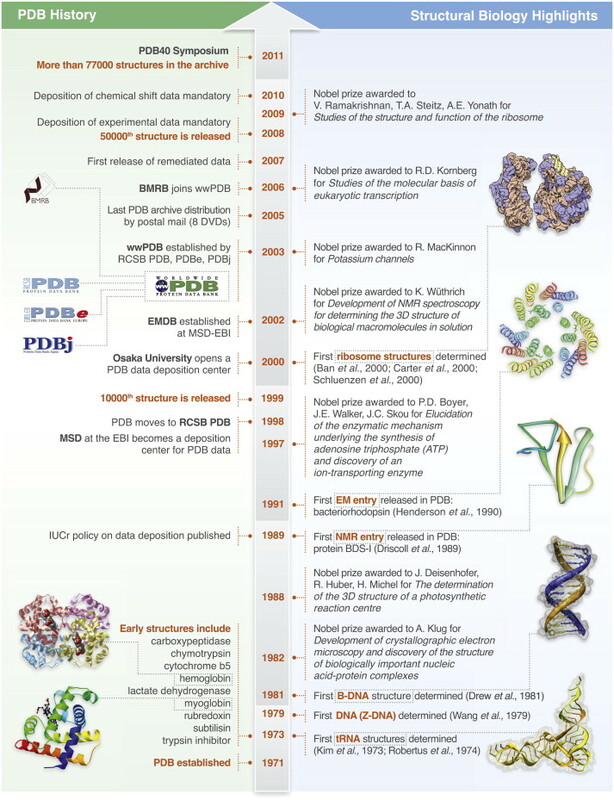 Below is a time line of key PDB events and structural biology highlights, from 1971 to 2011. Left are the key events in the evolution of the PDB. Right are selected key structures in the field of structural biology. Taken from The Protein Data Bank at 40: Reflecting on the Past to Prepare for the Future.